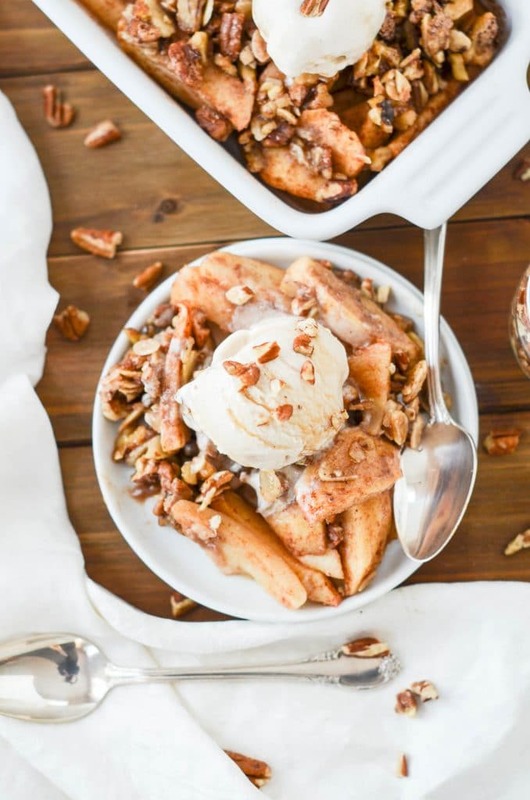 Home » Dairy Free » The Most Awesome Paleo Apple Crisp! 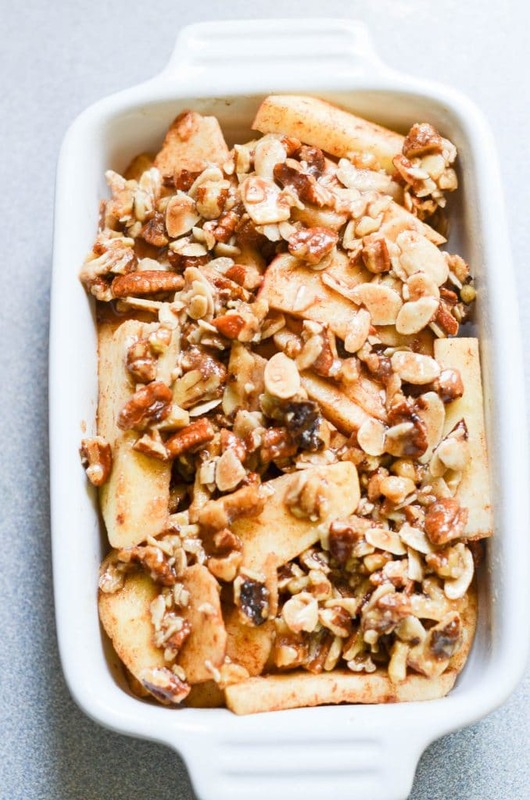 Paleo Apple Crisp is one of my favorite fall recipes. And this grain, gluten, and dairy free paleo apple dessert is simple and delicious. Apple picking with my daughter seems like yesterday. Climbing up ladders that were propped up against trees to score the out of reach fruit was a favorite of hers. Then it was apple dishes for days. And you know we always chose the largest bag so we had quite an abundance. But apples keep well for a while, so it’s all good. These days, apple picking has taken a back seat to driving lessons, sporting events, and clothes shopping. 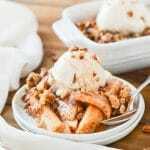 With time a precious commodity, it’s a good thing this grain-free apple crisp is a super simple and quick recipe. You’ll want a sturdy baking pan, and I just treated myself to a pan similar to this (mine is 19cm 7″), which I love. This pan will get plenty of use this fall and is the perfect size for two servings. 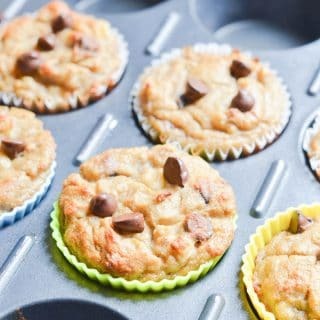 For a larger almond flour apple crisp recipe, simply double the recipe and use an 8 x 8 pan. Which type of apples works best? 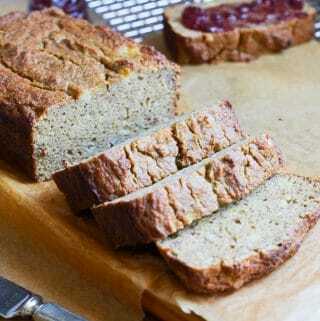 In this recipe, I used Gala apples because it is what I had, but I have used Fuji and granny smiths. Not being fussy, I would try any type of apple in this recipe. I call this the two bowls and a cutting board recipe. The apples and a few spices in one bowl and the topping in the other. Use the cutting board to slice apples and nuts. 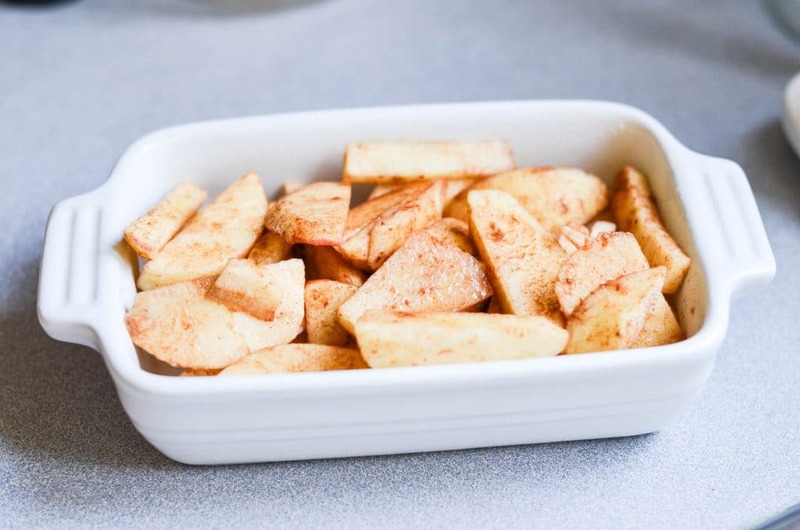 Sliced apples with lemon and orange juice, cinnamon and sea salt in the baking pan. For your efforts, you will be rewarded with a house with the aroma of cinnamon and apples. And that equals cozy. Apple slices in baking pan. Crisp mixture ready to be sprinkled on apples. If there happen to be any leftovers, try warming up for breakfast or have it cold (amazing!). Or better yet, make two so there is a guaranteed future breakfast! The breakfast topping of choice: drizzle with a bit of maple syrup. 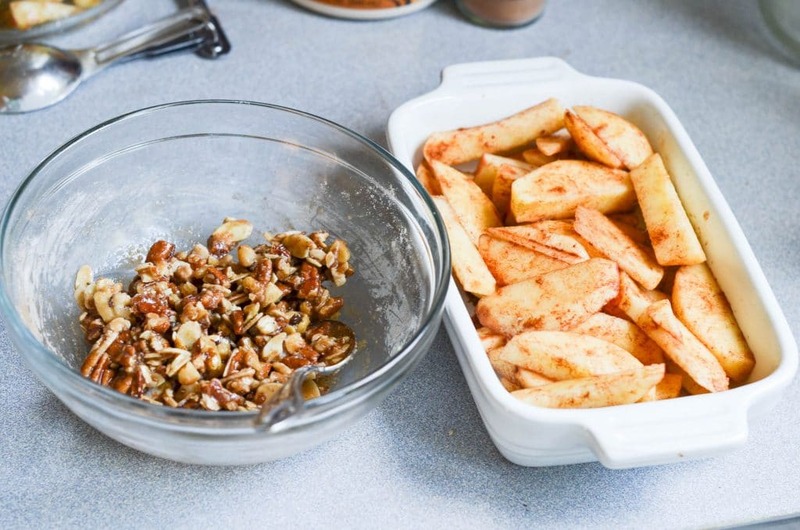 Crisp mixture sprinkled on apples. Ready for the oven! 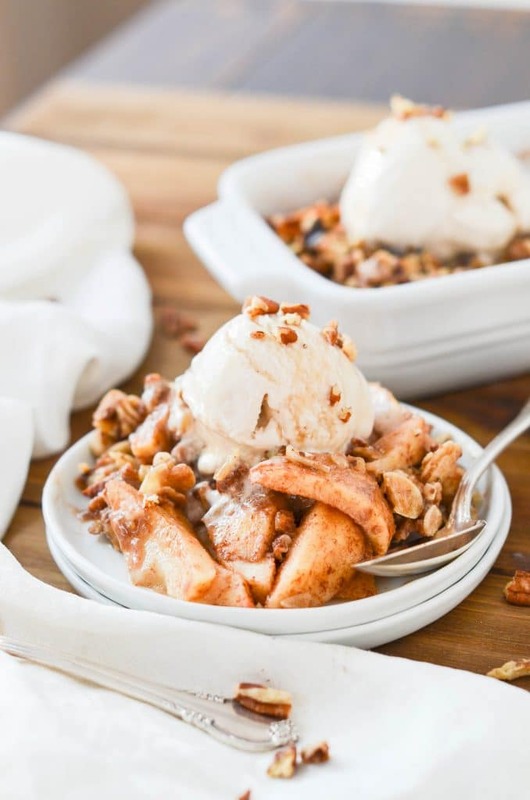 This apple crisp recipe combines fresh apples with chopped nuts, ground cinnamon, tapioca starch/flour, coconut sugar, maple syrup, lemon juice, orange juice, almond flour, and sea salt to make a delicious dessert. 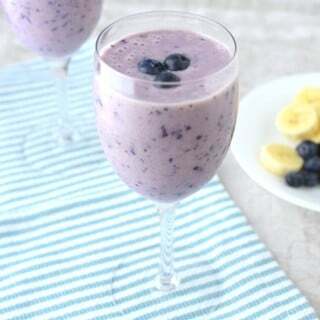 And, what a great healthy breakfast idea. The almond flour apple crisp would be a wonderful Thanksgiving dinner dessert. 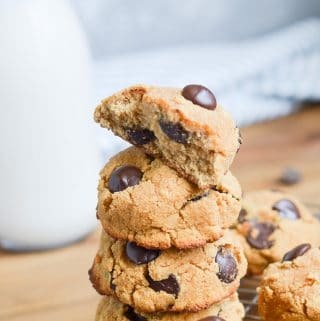 With a scoop of your favorite non-dairy ice cream or coconut whipped cream, it would be divine! 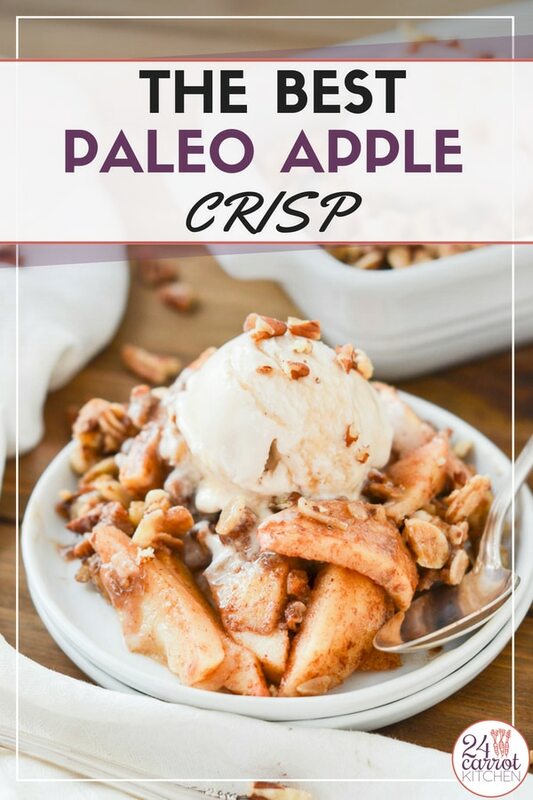 An easy Paleo apple crisp recipe that is grain, gluten and dairy free using less sugar/sweetener than most traditional crisp recipes. 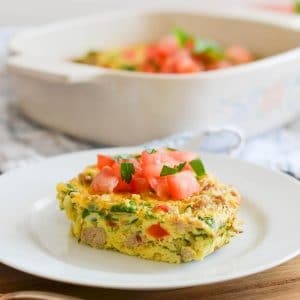 Make a double batch and have some for breakfast! Peel and slice apples and place in large mixing bowl. To the apples, add the lemon juice, orange juice, cinnamon and sea salt. Toss with a spoon to combine. Spread the apple mixture in the prepared casserole baking dish. Set aside. 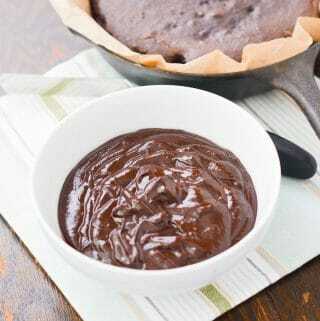 In a medium sized mixing bowl, combine the topping ingredients. Stir to combine well. Spread topping over the top of the apples and place in preheated oven. Bake, uncovered, for 30 minutes or until apples are tender and cooked through. 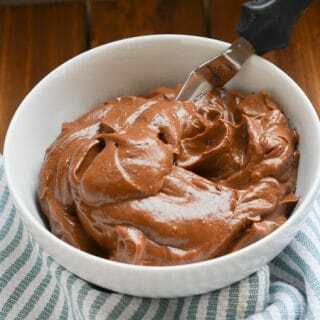 Add your favorite non-dairy topping; ice cream or coconut whipped cream are great choices! Previous Post: « How To Make Awesome Paleo Granola! 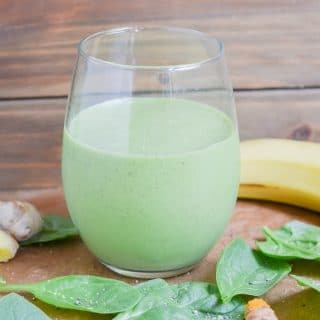 Could I use corn starch instead of tapioca? 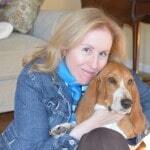 Hi Jackie! I have not tried with cornstarch as I don’t use it, so I am not sure. My guess is that it would work.